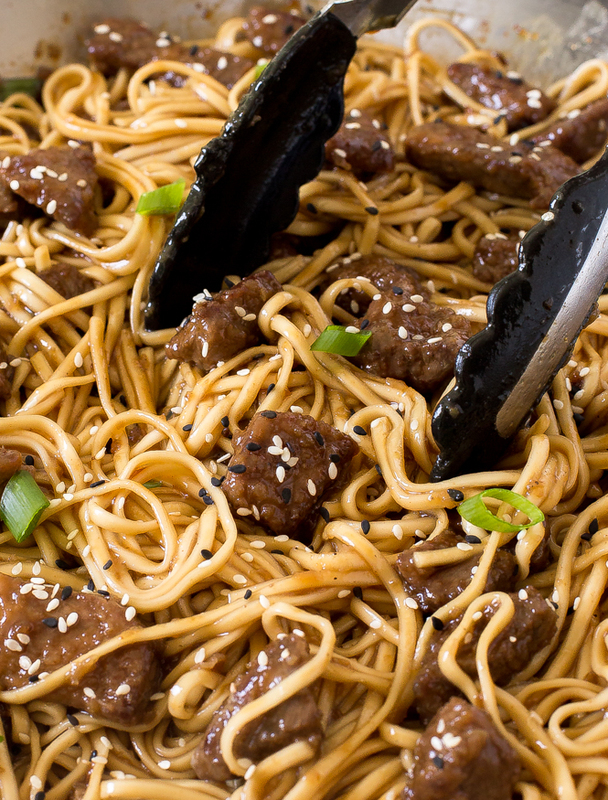 20 Minute Beef Teriyaki Noodles. Tender stir fried flank steak and noodles tossed in a homemade teriyaki sauce! 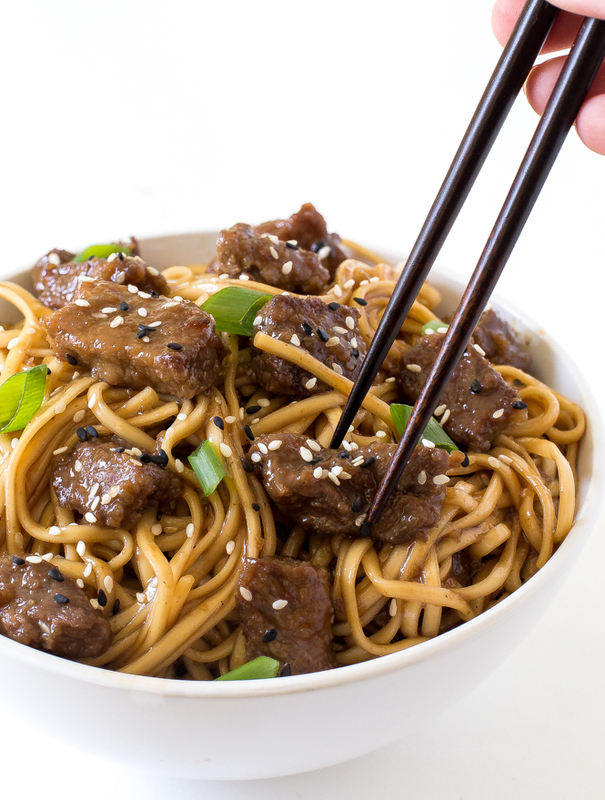 These Beef Teriyaki Noodles are comfort food at it’s finest. Tender cubed flank steak sauteed until tender and tossed with noodles and a homemade teriyaki sauce. It’s a super easy 20 minute meal! To keep the beef extra tender I coat it in cornstarch before sauteing. This helps to thicken up the sauce as well as prevents overcooking and toughening of the meat. After it’s coated in cornstarch I flash fry the flank steak in very hot oil. I also like to cook my steak in batches to prevent overcrowding of the pan and to make sure the beef caramelizes on the outside. 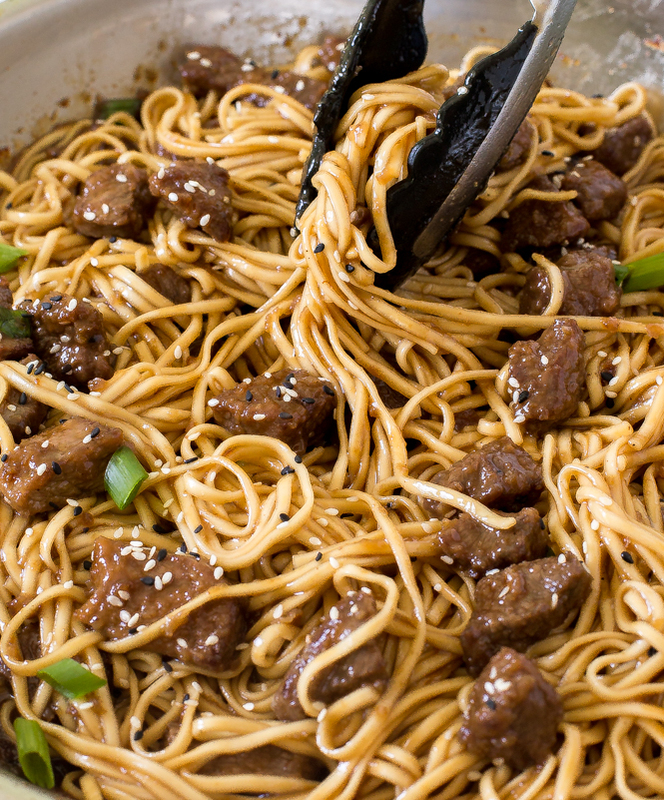 The steak and noodles are coated in lots of sauce and finished off with sesame seeds and green onions. 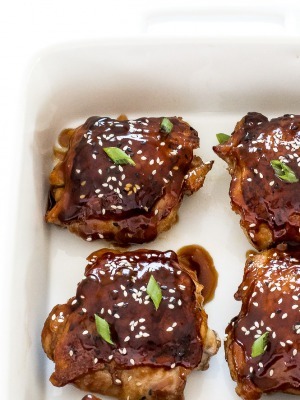 Making your own teriyaki sauce at home is so much better! I used the same homemade teriyaki sauce as my Easy Teriyaki Beef Meatballs and my Teriyaki Baked Salmon. 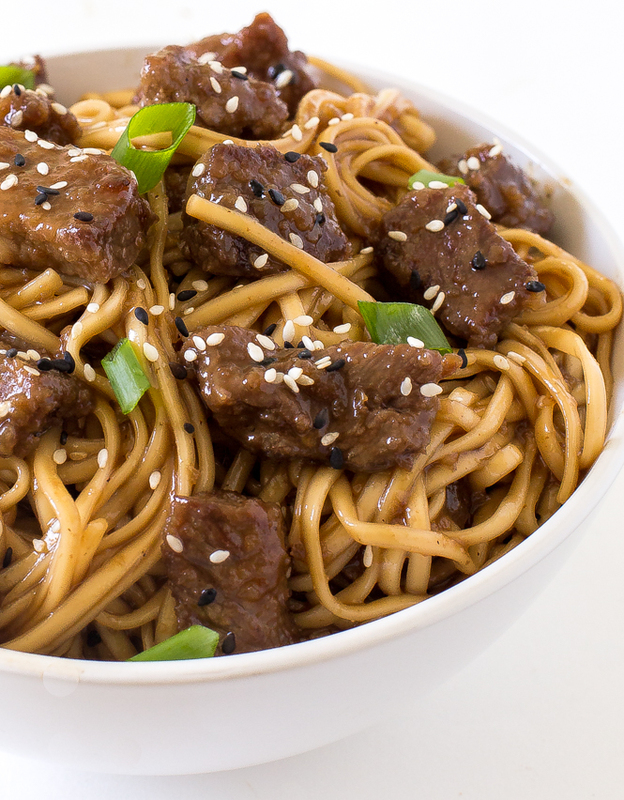 These Beef Teriyaki Noodles are the perfect meal for a busy weeknight. All you need is one pan and 20 minutes! Enjoy! In a large bowl toss the beef with the cornstarch and set aside. Cook noodles per package directions, set aside. When the oil is nice and hot add in the steak (I had to do two batches to avoid overcrowding the pan, if you do this you will need a bit more oil). Sauté until browned on both side, 3-4 minutes. Remove from the pan and set aside. Add the remaining tablespoon of oil to the same pan. 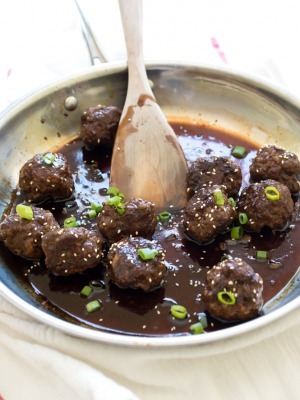 In a small bowl combine soy sauce, mirin, brown sugar, sesame oil and fish sauce. Pour the soy sauce mixture into the pan and bring to a simmer and cook for 2-3 minutes. Add steak and noodles to the pan and toss to coat with the sauce. Serve immediately with green onions and sesame seeds if desired. Thank you for this quick & delicious recipe. It’s darn delicious! Hi. So I decided to use beef round think cut . Will it turn out just the same? I think it should be fine if you cook it quickly and it is a thin cut of meat. I just made this for the hundredth time for dinner tonight, although I prefer using chicken in place of beef! Try it out! So glad you like it Koda!! What noodles did you use in the pic? I used lo mein noodles. However spaghetti noodles or chow mein noodles could also be used.